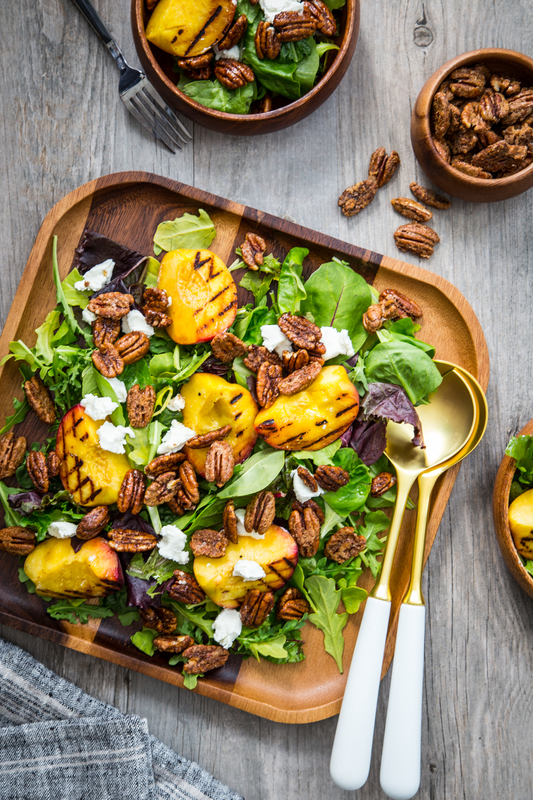 Spiced Pecan Grilled Peach Salad with Goat Cheese is the salad you crave on a warm summer night. 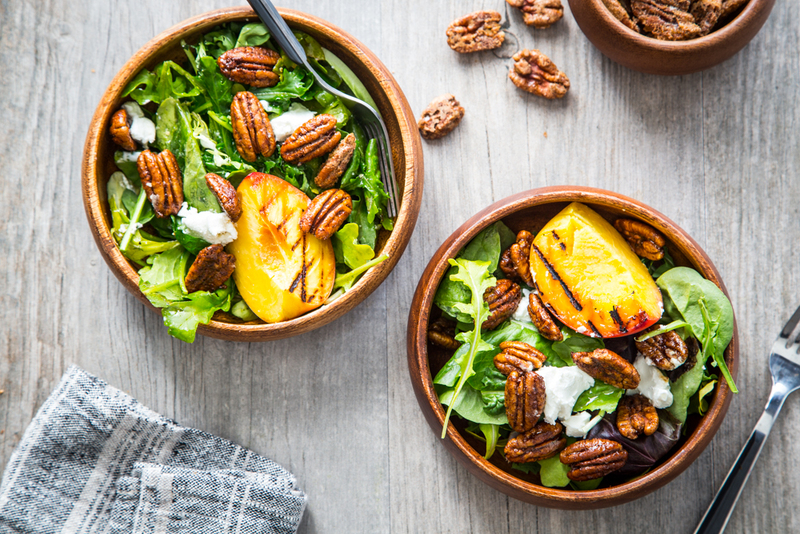 Tender greens, sweet peaches, and tangy goat cheese pair perfectly with lovely spiced pecans making each bite incredible. This post is sponsored on behalf of the American Pecan Council. All opinions are my own. Friends, today is my birthday!! That’s right, today I turn 35 and I’m feeling pretty great about it. You might think that I would be sharing a big birthday cake recipe, but if you’ve been a long time reader of Jelly Toast, then you know that cakes aren’t really my thing. In fact, you won’t find even one traditional cake recipe on my blog. Occasionally I’ll make ice cream cakes or a coffee cake, but honestly, when it comes to birthday celebrations, we tend to focus on making an awesome dinner and we’ll follow things up with some s’mores or an ice cream sundae. House rules state that the birthday girl/boy gets to pick whatever they’d like to eat for dinner on their birthday (it’s important to note that I made the house rules). As a kid, salad was one of my favorite things to eat. I was kind of a strange kid, but it’s true. I loved a great salad and still do to this day. But I tend to like salads with a lot of components to them. Not just a huge bowl of greens with a few measly toppings sprinkled on top. I like a salad that is packed full of awesome ingredients making every bite interesting. So, in celebration of my birthday I’m bringing you my current favorite summer salad combo: Spiced Pecan Grilled Peach Salad with Goat Cheese. It’s a mouthful of a name but it’s also a mouthful of a salad. 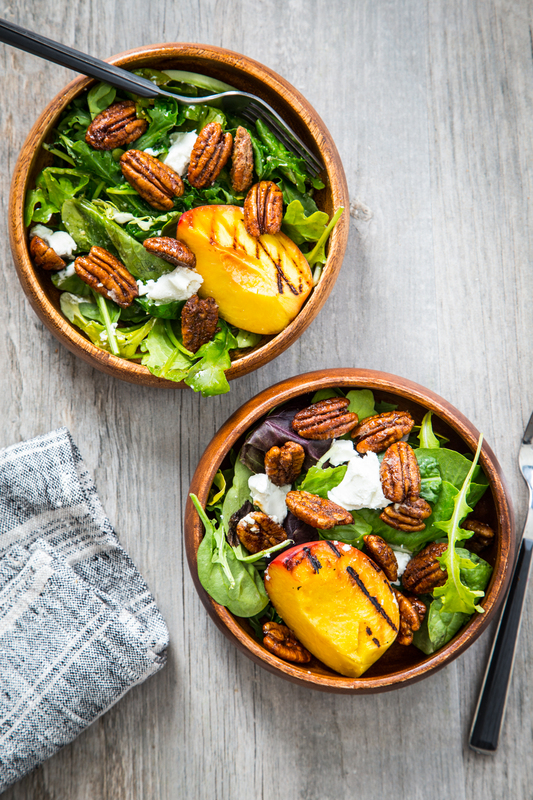 It starts with a lovely bed of greens, topped with grilled peaches, tangy goat cheese, my classic vinaigrette and the best part – spiced pecans! You guys, if you have never worked with pecans outside of a (albeit delicious) pie I cannot not encourage you enough to try pecans in your everyday cooking and eating. They are naturally sweet in flavor and are pretty much nutritional powerhouses. Pecans are a good source of monounsaturated fats, which is the same type of heart-healthy fat found in avocados and olive oil. They are also low in carbs and high in fiber, which makes them friendly to many ways of eating. Recent research also indicates that eating a serving of pecans a day may help reduce your risk of heart disease. They are truly my favorite tasting nut to eat raw and unflavored as they have a rich, buttery flavor and natural sweetness with no bitterness. While they are perfect for snacks, they are also so incredibly versatile and can be seasoned and spiced to fit any recipe. 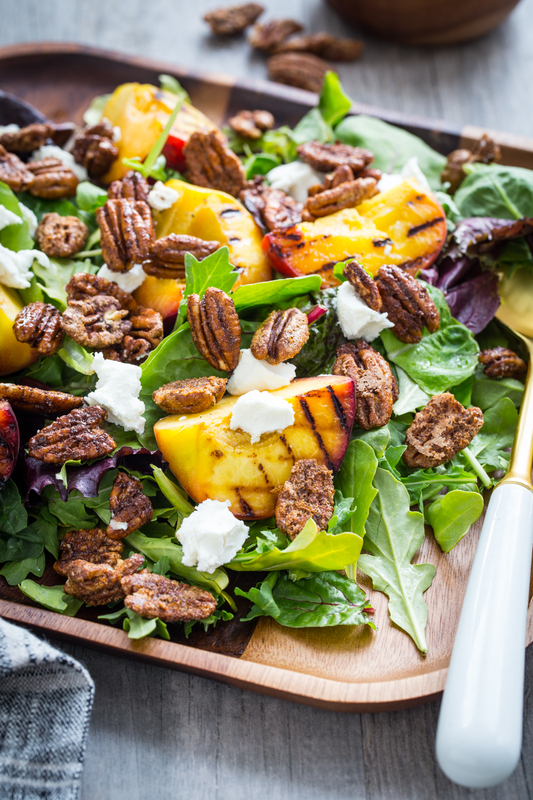 In this Spiced Pecan Grilled Peach Salad, I used brown sugar, cinnamon, and a bit of cayenne for a great sweet/spicy combo without overpowering the natural pecan flavor. 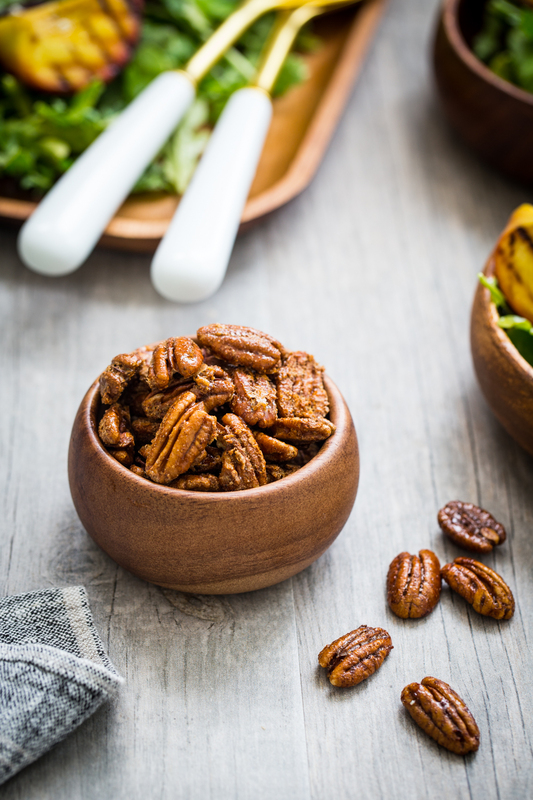 The spiced pecan portion of this recipe can be doubled or tripled to keep on hand for snacking. Be sure when you are baking the pecans that you spread them in a single layer and stir occasionally while they are in the oven. This will keep them roasting evenly and also prevent them from sticking to one another. 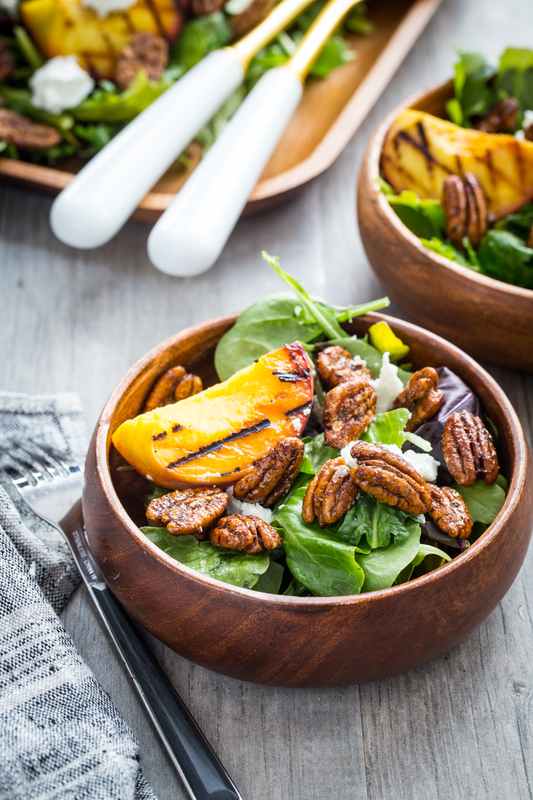 This Spiced Pecan Grilled Peach Salad with Goat Cheese is great on its own for a light dinner, but I’m planning on serving it alongside a juicy burger for my ultimate birthday meal. Preheat oven to 275°F. Line a rimmed baking sheet with parchment paper and set aside. In a medium size bowl, whisk together egg white, brown sugar, cinnamon, cayenne pepper, and salt until well combined. Fold in pecans and mix until pecans are evenly coated in mixture. Spread in a single layer on prepared baking sheet. Bake for 45-50 minutes, stirring occasionally until pecans are fragrant and golden brown. Allow to cool completely. In a small bowl, spouted measuring cup, or mason jar, whisk together 1/2 cup olive oil, white wine vinegar, dijon mustard, garlic powder, and salt & pepper. Set aside. 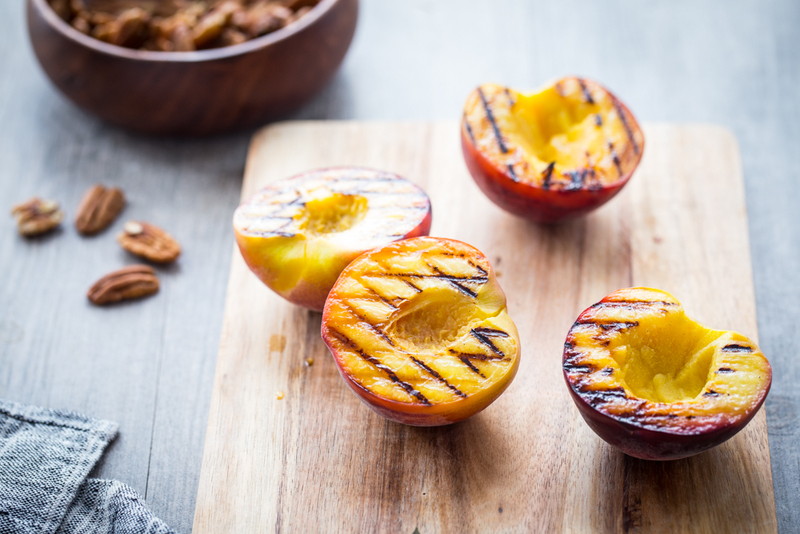 Brush cut side of peach halves with remaining olive oil and grill on an outside grill or grill pan on stove top set over medium/high heat until grill lines appear and peaches become tender; about 7-9 minutes. Remove peaches and cut into slices. Divide greens among four plates. Top with grilled peach slices and goat cheese. Divide spiced pecans evenly among the salads and top with a drizzle of the vinaigrette. Serve and enjoy!